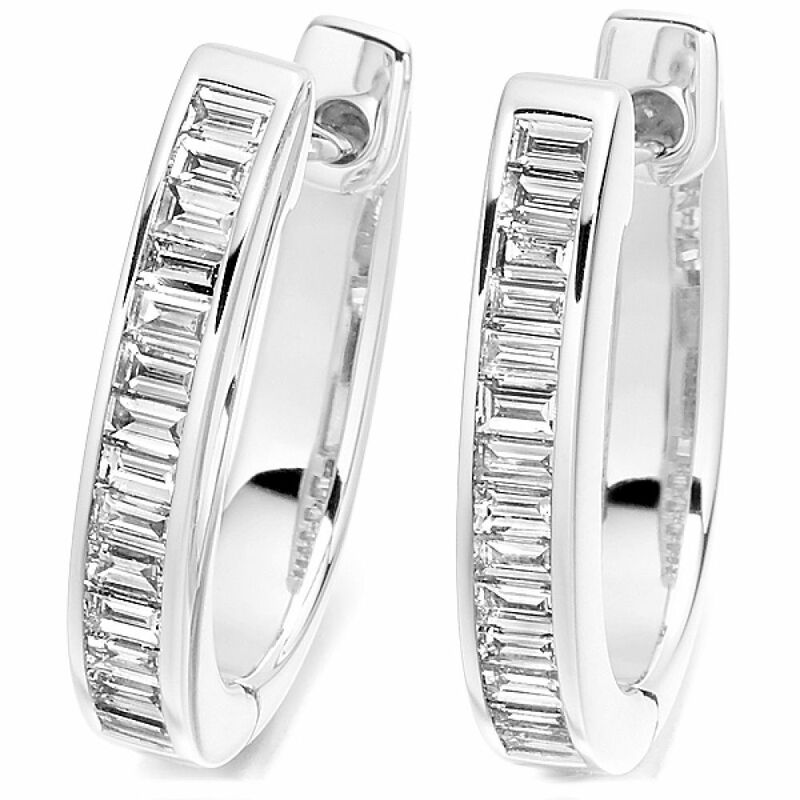 Diamond hoop earrings channel set with a matching set of Baguette Cut diamonds. 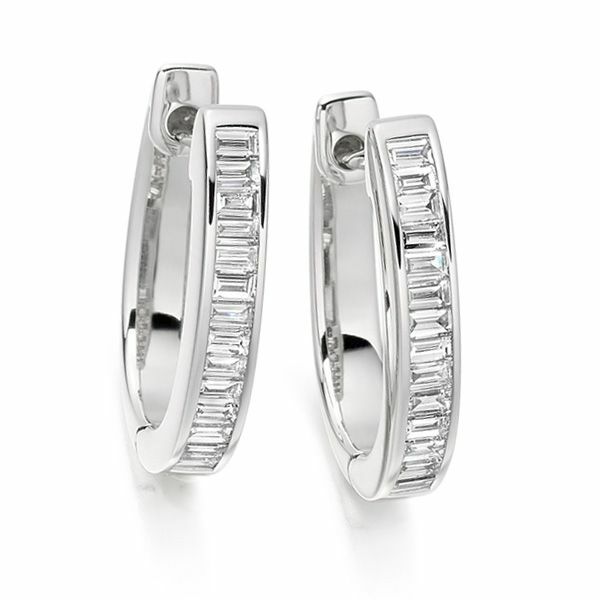 A distinctively styled pair of Baguette cut, Diamond hoop earrings, that would grace any jewellery suite. The beautifully cut Baguette Diamonds have a total carat weight of 0.55 carats and are expertly set within a channel setting that accentuates the radiance and shine of each Diamond. Each Diamond has been graded F Colour, VS1 Clarity prior to being set and the finished earrings are available in 18 Carat White, Rose or Yellow Gold, 950 Palladium and 950 Platinum. The earrings are skilfully crafted to order so please allow 4 weeks for delivery. Your earrings will then arrive to you beautifully presented in our bespoke packaging ready for the perfect moment. Ireland and 100% Ethical Fairtrade Gold? Across Ireland, we now ship commissions crafted in responsibly sourced, fully traceable Fairtrade Gold. This ethical precious metal choice is a more expensive option to regular 18ct Gold but at Serendipity Diamonds we do not charge any extra, making this choice even greater value for money. We ship Fairtrade Gold across Ireland each week, in the form of engagement rings, wedding rings and other diamond jewellery. As licensees with Fairtrade Gold we can also create bespoke commissions for our Irish clients in this responsible precious metal choice. All diamond earrings arrive in Ireland, beautifully presented in luxurious packaging, boxed securely and sent by Royal Mail International Signed for Delivery. Parcels arrive within approximately 2 days and require a signature upon arrival. Our website price includes shipping to Ireland and further details can be seen below on our packaging and delivery page. Enjoy the additional peace of mind from 2 additional pairs of Lox earring backs in addition to your precious metal butterfly attachments. Use the menu's above to select your preferred total carat weight, colour and clarity for your diamonds. All diamonds are 100% natural, with conflict free assurances. We match each pair of diamonds by expert trained eye to ensure consistency and brilliance from each diamond. Where certification is included we work with the most reputable diamond grading laboratories for your total reassurance including GIA.